Welcome back! In today’s post, I’m very excited to share with you my exclusive photo shoot of the amazing Victorian interiors at the Ebenezer Maxwell Mansion in Philadelphia, PA. 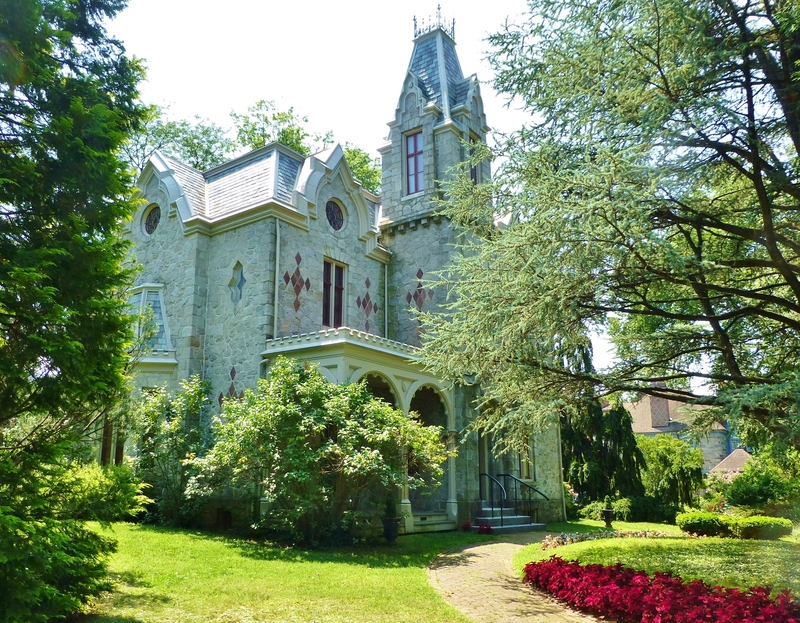 This suburban 19th century home is located in the Tulpehocken Station Historic District of Philadelphia, and is the only authentically restored Victorian Era house museum in the Philadelphia area. The masonry and stone building is two-and-a-half stories, and has a three-story tower at the front. The roof is in the mansard style, with slate covering. The house has three lovely porches and four stone chimneys. I am so excited to do a feature on the interior of the mansion. It’s been a favorite of mine for a long time! 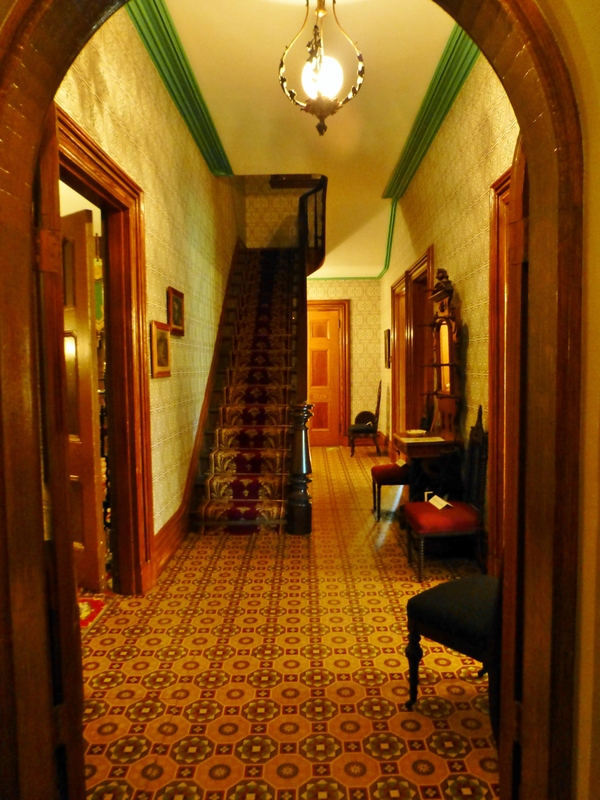 The entry hall of the Ebenezer Maxwell Mansion features true Victorian elements with lots of pattern. Wallpaper is a prominent feature, as is the historically accurate linoleum floor (a Victorian innovation fabricated with Linseed Oil). Also of note is the richly patterned stair runner with brass rods. Once inside the spacious foyer, one notices the large ‘Hall Tree’. This is an important piece of furniture in every Victorian Home, since coat closets are a modern idea. This one has much needed coat and hat hooks along with umbrella and cane storage. 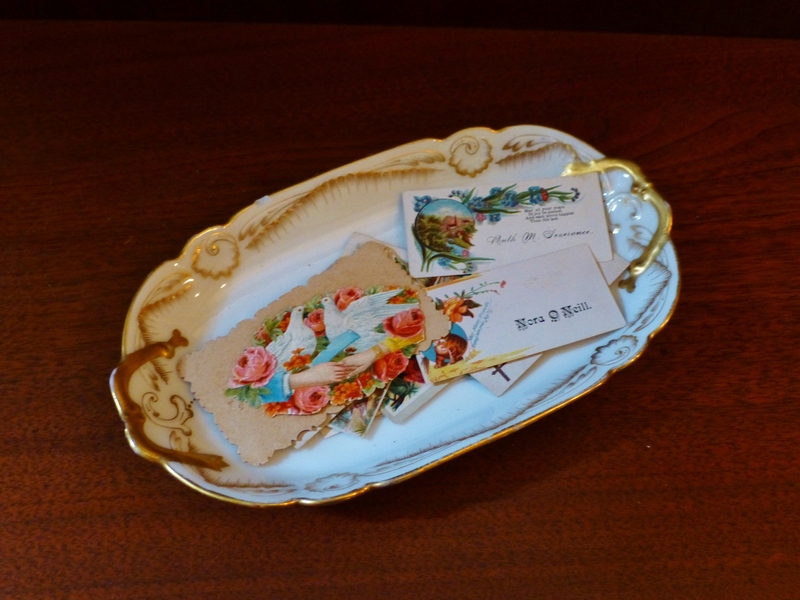 Another important item in the Victorian foyer is the ‘Calling Card Holder’. Visitors to the house would always leave their calling card in a receptacle like this one. 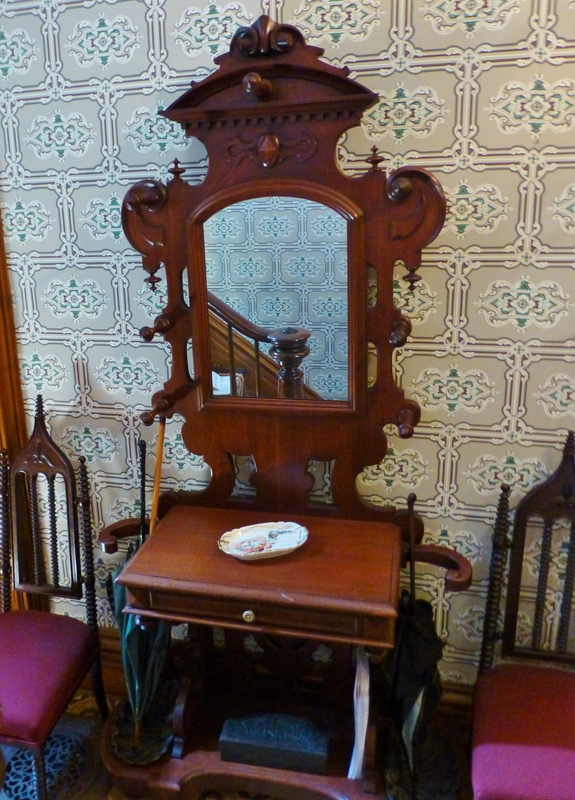 Flanking the Hall Tree are a pair of lovely Victorian Gothic Revival chairs. These are fabulous examples of this quintessentially Victorian furniture. Don’t you just love all the spool turning–so exotic! This image also shows a better close-up of the geometric pattern in the linoleum floor, and the ‘Ashlar Block’ style wallpaper that was so popular at the time this home was built. Let’s move on into the living room, or as the Victorians called it: the Parlor. The Victorians loved layering pattern. This large floral geometric patterned wall-to-wall carpeting was a popular Victorian flooring choice in the second half of the nineteenth century. The ornate bold green draperies feature gold bullion fringe and luxurious trimmings. 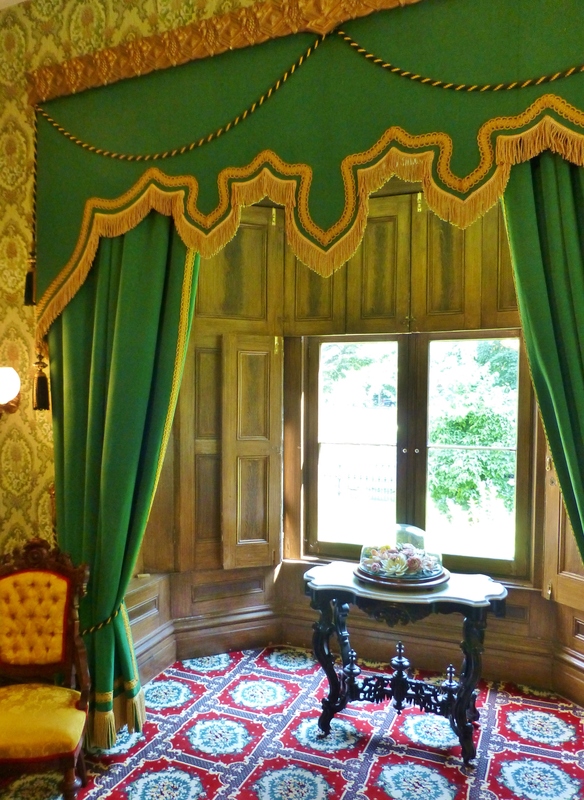 This photo shows more detail of the authentic Victorian window treatments, including the fitted shutters at the windows which totally block all light when desired. 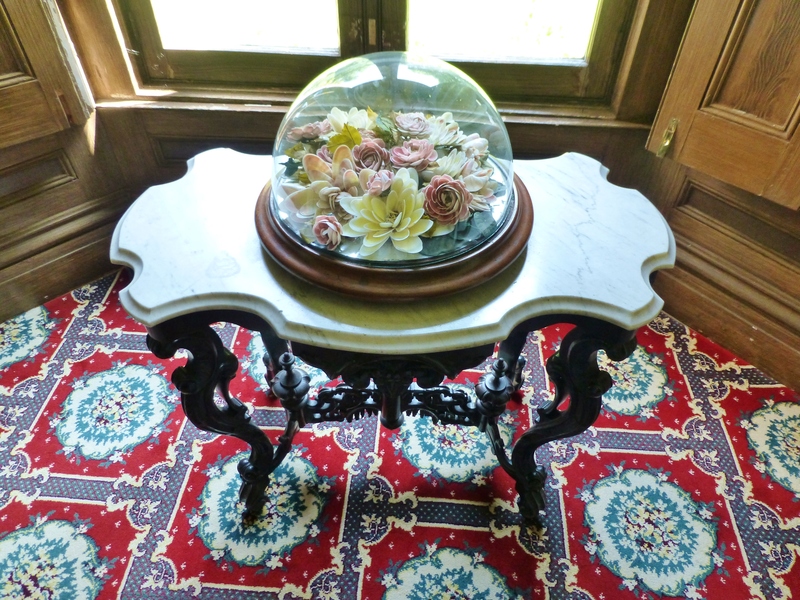 The Victorians enjoyed putting all types of things under glass: wax, sea shells, wool, silk, and even human hair, all of which were placed under glass domes for their protection and posterity. The black slate fireplace mantel is quite lovely, especially when paired with that amazing mirror! This photo also features the variety of chairs around the centrally located parlor table. This table has a chocolate colored marble top with white veining. Notice the finials and turnings that were popular in Victorian furniture. 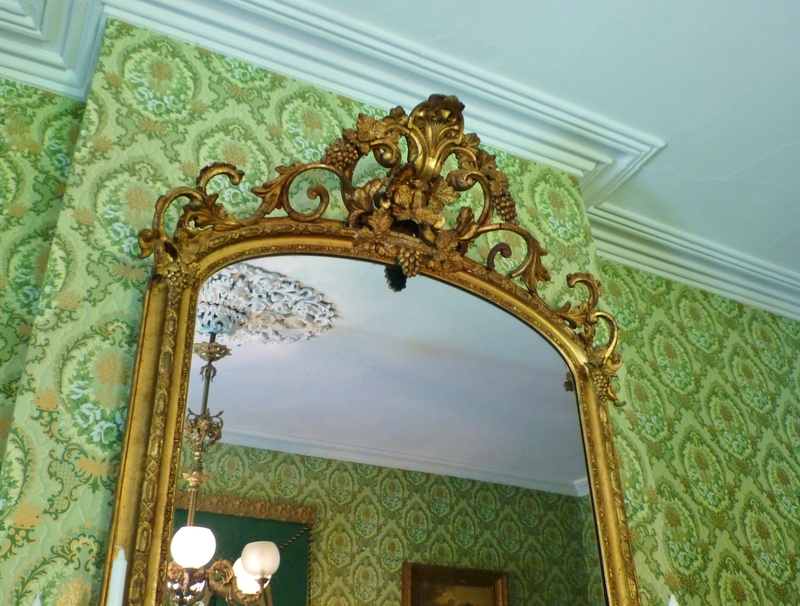 The glorious gilt mirror above the fireplace mantel goes all the way to the crown moulding. It is adorned with ornate scrolls and sculpted grapes. Reflected in the mirror is the equally ornate plaster ceiling medallion from which the chandelier is suspended. 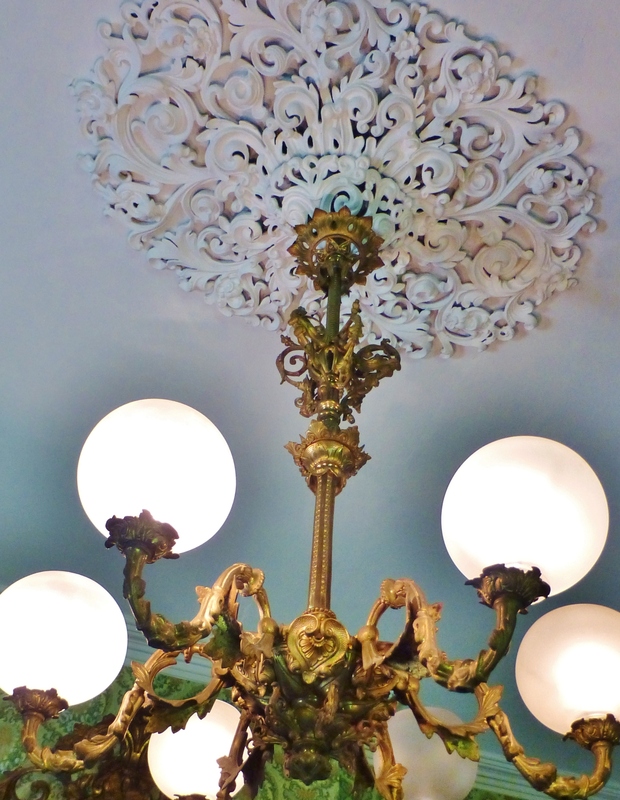 A detail of the opulent chandelier and ceiling medallion in the parlor at the Ebenezer Maxwell Mansion. 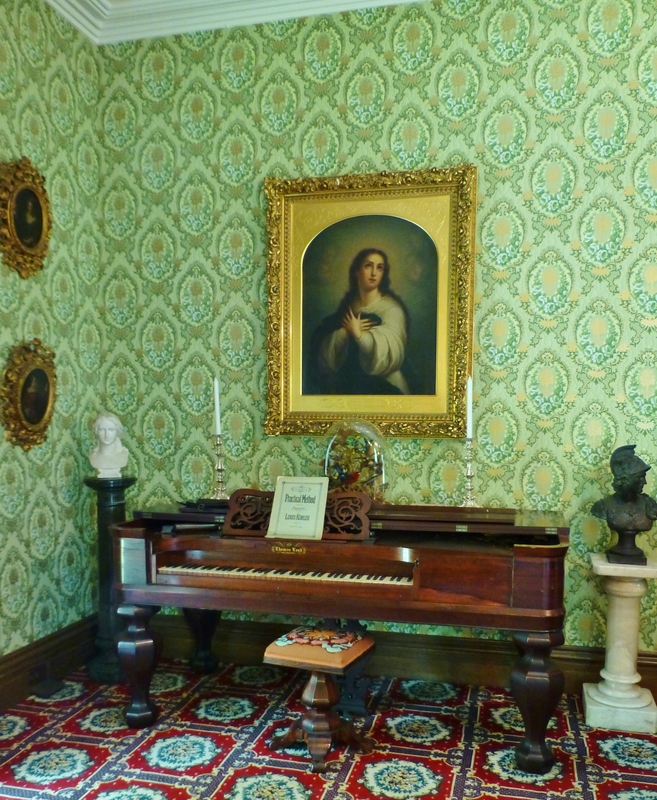 In a far corner of the parlor at the Ebenezer Maxwell Mansion is a Thomas Loud piano. Loud Brothers was a very early Piano Manufacturing Company based in Philadelphia, PA, which went out of business in 1837. Loud Brothers instruments are exceedingly rare and of museum caliber today. By the way, don’t you just love the twirly needlepoint-covered piano stool? I have 2 of these in my own collection–they’re so quirky and fun! Did you spot this amazing example of Victorian Bird Taxidermy on top of the piano? 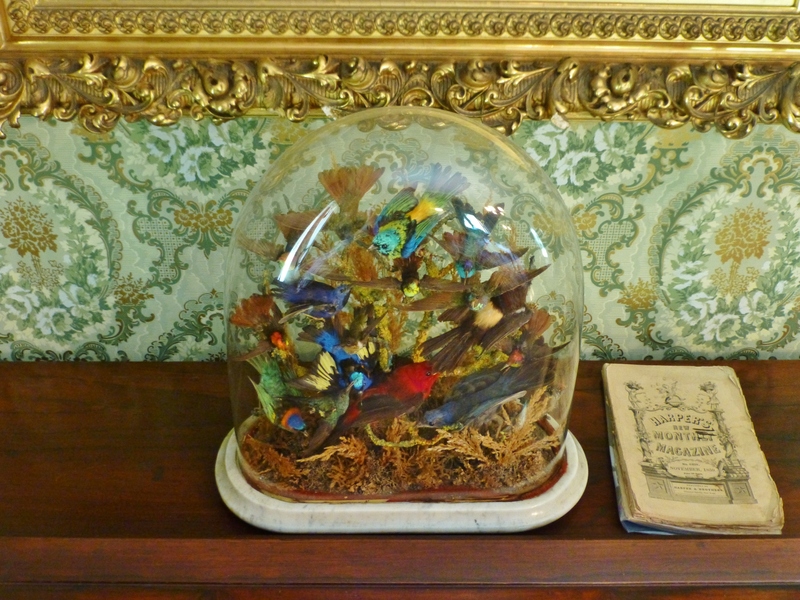 The colorful birds are preserved under a glass dome with a marble base. 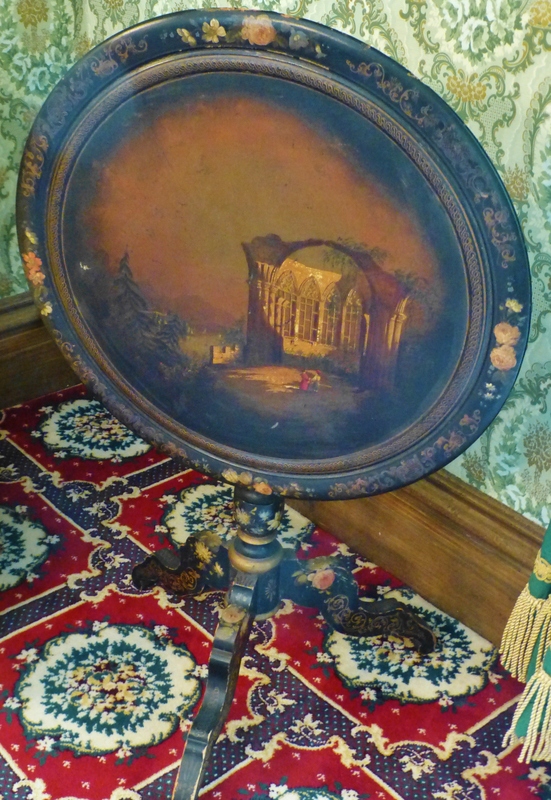 This too was a popular Victorian interior decoration and is still very collectible today. Another corner features a sumptuous gold tufted Renaissance Revival settee. It is heavily carved with lots of medallions and cresting, typical of this style. I also love the hand-painted tilt-top table in the corner. Isn’t it great when a piece of furniture is also a piece of art? A detail of the charming hand-painted table. The image is of a couple enjoying a Gothic ruin. There are lovely flowers painted around the perimeter and on the legs. 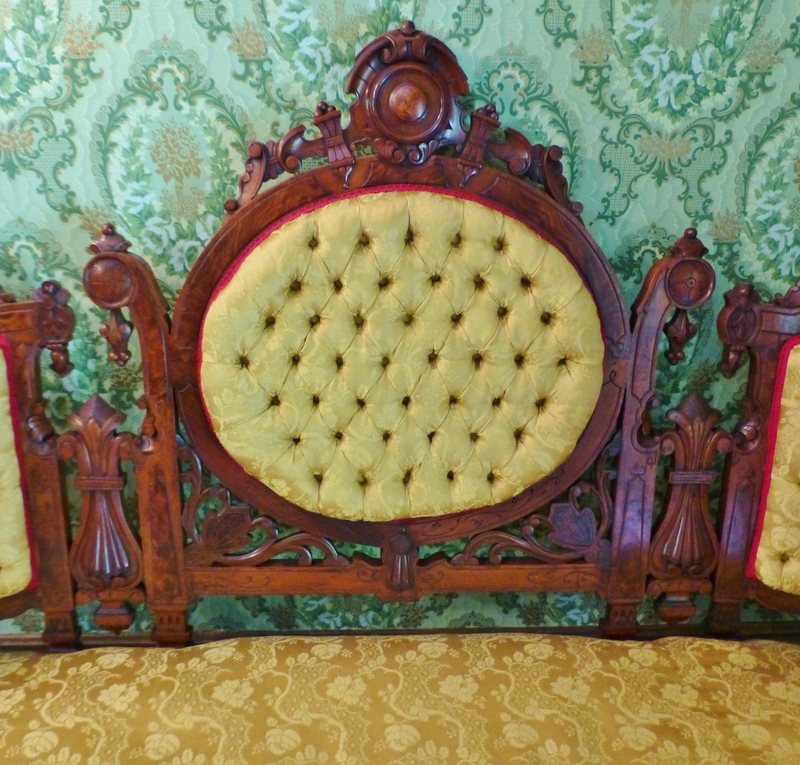 The Renaissance Revival settee in this photo has such amazing carved details and is one of a pair found in the parlor, along with some matching chairs. These are such sculptural pieces of furniture. The cheerful yellow upholstery really brightens the dark (but beautiful), heavily carved wood. 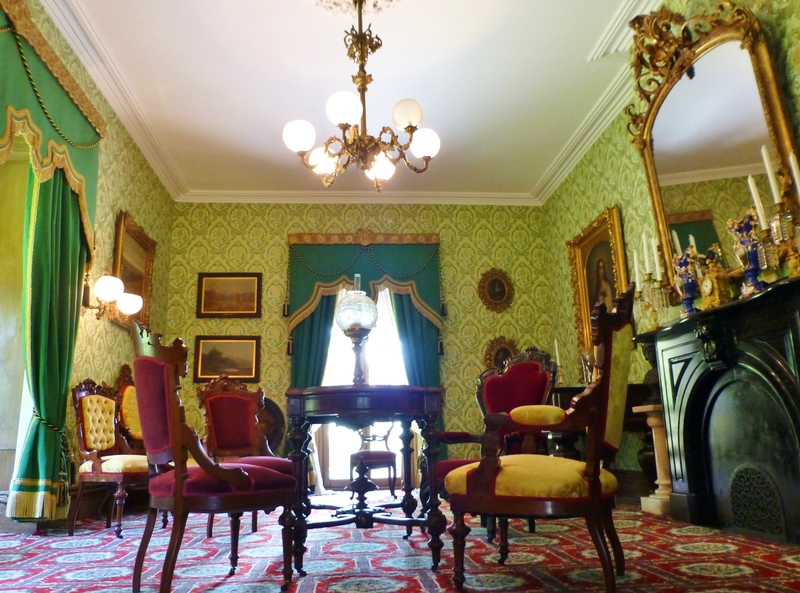 I’ll leave you with this final colorful image of the Victorian Parlor at the Ebenezer Maxwell Mansion. I love how the sun is streaming through the windows and through the ornately turned legs of the table. Visiting this place in person, makes you feel like you’ve steeped through a time warp. 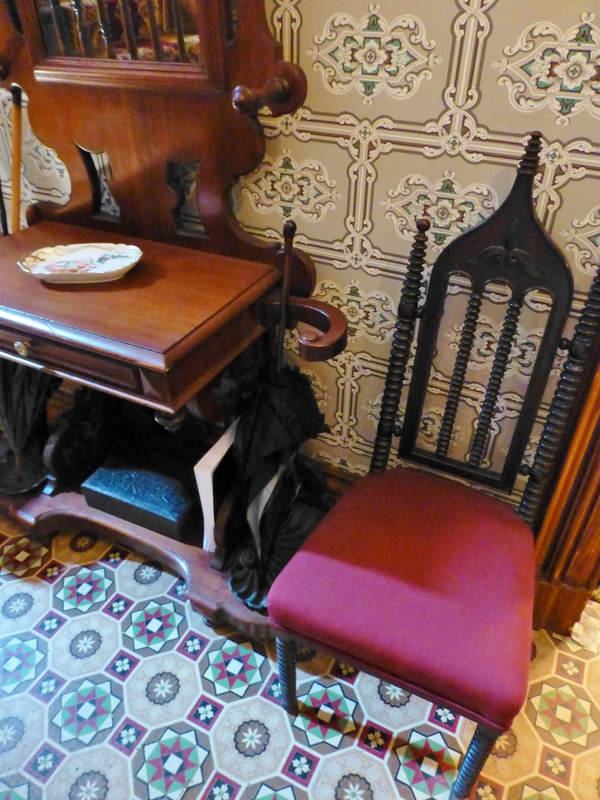 It’s so authentically Victorian, but everything is in pristine, top-notch condition. You should definitely make plans to visit this museum soon! 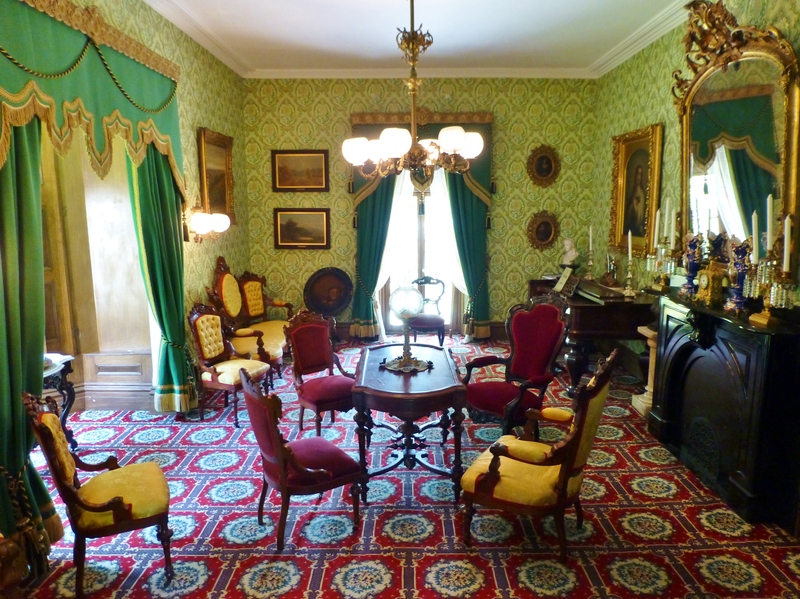 Next time we’ll continue our tour of the historic Ebenezer Maxwell Mansion by visiting the study and the formal dining room. I have so much more to show you! Until then, please leave me your comments, and let me know what you think of these colorful, full-of-pattern rooms. I always love to hear from you, and I’m even more happy if you share my blog and tell your friends about me…I need all the friends I can get! This entry was posted in Antiques, Architecture, Historic Sites, Interiors, Victorian and tagged Chandelier, Draperies, Entry, Furniture, Gothic, Hall Tree, Linoleum, Mansion, Parlor, Pennsylvania, Robinson interiors, Wax Flowers. Bookmark the permalink. Now that’s what I call character! You can really feel the personality of that home. 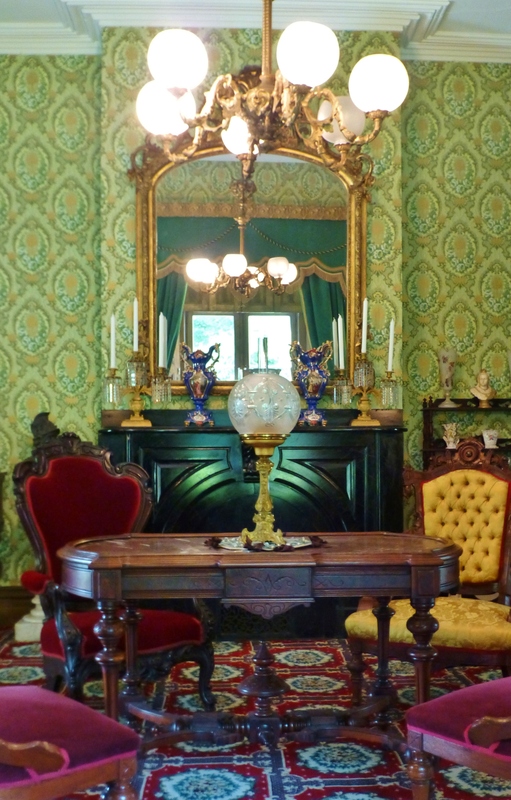 Agreed–That is a vibrant Victorian Interior for sure…they were not afraid of color, Donna! 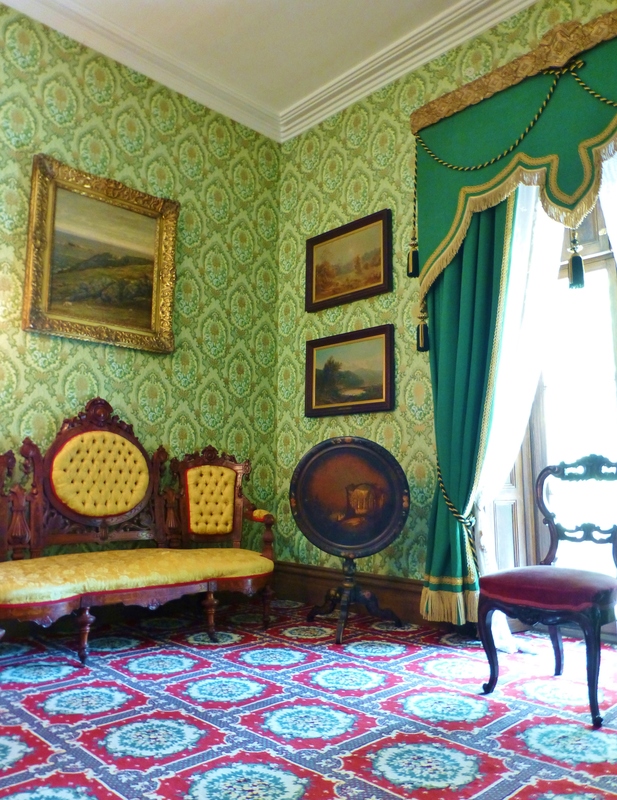 But there are so many cool elements in this room…Victorian furniture is like sculpture, don’t you think? Oh of course! I had a client with a Victorian home and it was such a fun color palette to design. Wish more people would love that much color.